PT Indofarma Global Medika - IGM is a rapid growing company in Indonesia that deals with pharmaceutical industry. PT Indofarma Global Medika is a strategic subsidiary company of PT Indofarma (Persero) Tbk (Indofarma Group), a reputable state-owned pharmaceutical company in Indonesia. 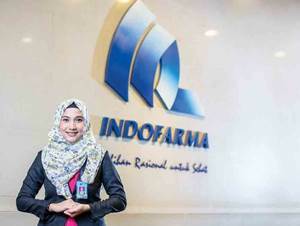 Indofarma Group is the majority shareholder at IGM, with 99.999% of ownership. Other 0.001% remaining shares in IGM was owned by Koperasi Pegawai Indofarma. PT Indofarma Global Medika operates primarily as a distributor of Indofarma Group products in Indonesia. IGM running business in wholesale distribution and trade of drugs and medical equipment. As of December 2015, PT Indofarma Global Medika has 34 branch offices spread across Indonesia. The financial performance of PT Indofarma Global Medika in 2013 showed a good improvement, which was from a loss of Rp 3.77 billion in 2014 to a loss of Rp 1.73 billion in 2015. PT Indofarma Global Medika successfully recorded its total sales of Rp 1,605.64 billion in 2015, an increase of 189.55% (yoy) from the previous year (Rp 1,354.36 billion in 2014. PT Indofarma Global Medika managed to record a total asset of Rp 906.41 billion at the end of 2015 or equal to an increase of around 43.90% compared to the previous year of Rp 629.90 billion, according to PT Indofarma (Persero) Tbk Annual Report 2015 as cited by JobsCDC.com. Background in Pharmacist, preferably in Clinical Pharmacist. Have a good understanding about CDOB. JobsCDC.com now available on android device. Download now on Google Play here. Please be aware of recruitment fraud. The entire stage of this selection process is free of charge. PT Indofarma Global Medika - PBF Pharmacist Indofarma Group November 2016 will never ask for fees or upfront payments for any purposes during the recruitment process such as transportation and accommodation.